Request Your Appointment Now ! THE FACE TREATMENT- The ultimate facial for women and men and teenagers. $80 for 60 minutes. Say goodbye to cookie-cutter treatments! 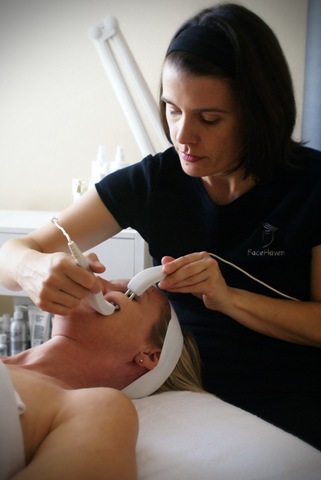 FaceHaven’s Skin Treatment is 100% customized to your skin’s needs with a thorough, zone-by-zone Face Mapping® analysis, making it one treatment… that’s different every time! Think of it as your personal routine, created especially for your skin’s needs, right on the spot. Our Skin Treatments are fully inclusive to deliver your skin’s best health, and involve a combination of professional double cleansing, exfoliation, ultra sonic, extractions (as needed), masque, toner and SPF protection. Bothersome breakout? Tired eyes? Dull skin? 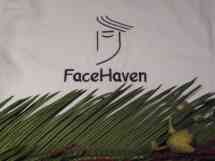 Visit FaceHaven for your MicroZone® Treatment – the 20-minute skin fix that gets you in, gets skin repaired and gets you out the door in a snap!Our expert skin therapists and amazing products will provide the solution on the spot in just 20 minutes with treatments like flash exfoliation (great for shaping up before events), extractions and even eye revitalization (perfect after long travels). That means no changing out of your clothes, no fuss and big results!We’ll even show you step-by-step how to identify your concerns and treat them effectively at home to maintain results. Make an appointment when you’re in need of some skin health attention in a minimal amount of time. MicroZone treatments are the ideal maintenance between Dermalogica Skin Treatments. • Eye rescue / brighten, firm, revitalize – Treat multiple eye area concerns like dark circles, puffiness, wrinkles, loss of volume and firmness with this advanced peptide eye treatment designed to gently exfoliate, rehydrate, smooth lines and boost new collagen while improving overall firmness and tone. • Lip renewal / smooth your smile – This supreme lip conditioning treatment smoothes away flaky damaged skin that can result from lip makeup and the environment. By infusing firming peptides and repairing vitamins into the perioral area, it restores the delicate lip tissue back to optimum health while smoothing fine feather lines and erasing the signs of aging. • Blackhead relief / clear and prevent breakouts – Want that super clean skin feeling? This deep cleansing, purifying treatment helps clear away blackheads, stubborn bumps and under surface congestion. Banishing any future breakouts but gaining clean, clear, smooth skin. For best results a 40 minute microzone is required. Age Repair – Revitalize and energize while fighting visible signs of aging with this restorative treatment. See immediate results when the skin is intensely exfoliated and treated with Dermalogica’s AGE Smart® products that pack the skin with nutrients and peptides to fortify, protect and restore skin back to its healthiest state. • Moisture Boost – Rehydrate and replenish dry, uncomfortably tight, thirsty skin. This deeply penetrating moisture surge treatment lifts away dulling skin debris to reveal plump new cells and helps to soften surface lines. Discover a revived, dewy, fresh face in a snap, this treatment is perfect for tired and travel weary skin! Skin Soothing – Quickly relieve redness, irritation and inflammation with this soothing, cooling treatment for sensitive skin. • Men’s skin fitness / make shave problems history – Shaving challenges and skin woes getting you down? This rapid treatment cleans deep, repairs and calms while tackling all your shave related skin issues. Get skin and shaving tips together with great looking skin in just a snap. Microcurrent is a technology that generates small amounts of pulsated energy that mirrors the body’s natural current and which serves to stimulate facial muscles thereby firming, lifting and toning them. As an example our cells perform a similar function to batteries they conduct electricity, create electrical fields and are powered by a very low level electrical voltage known as microcurrent. This in turn allows provides the voltage that enables cell functions such as receiving nutrients from the blood and removing cellular waste. Microcurrent uses probes to control the current in and out of the cell, re-educate the muscles and tone and lift the face, it also helps to increase blood and lymph flow and boost the cells mitrochondrias which are the little engines that produce the energy called ATP Adenosine Triphosphate the vital substance that feeds our cells and provide them the energy to produce more collagen and elastin. With a series of microcurrent treatments the skin results build with the natural cell turnover as the energized cells make their way to the surface. A back facial is the ideal solution for cleansing and exfoliating those hard to reach areas of the back and shoulders. If you have back acne, breakouts, sun damage or dry itchy skin. Athletes who find they break out under sports bras and t shirts- this back treatment is perfect for you too!